Sometimes it may seem like your skin is impossible to manage, especially when you wake up and find a huge zit on your nose or a cold sore at the corner of your mouth. The good news is that there are ways to prevent and treat common skin problems. Try these amazing products with 100% Natural ingredients. Mercury & Hydroquinone Free!!! For over 4,000 years, Shwe Pyi Naan's Organic Thanakha Sandalwood has been used as calming incense for peaceful meditation as it soothes the mind. But sandalwood is not only for mind relaxation, it is also effective against annoying skin bacteria and fungi. Moreover, it regenerates, hydrates and revitalizes stressed and ageing skin. Sandalwood oil extract with Organic Thanakha helps moisturize and hydrate dry, ageing and flaky skin. 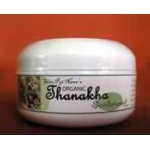 It also relieves itchiness, and its natural astringent properties balances oily skin. Shwe Pyi Naan's Organic Thanakha Shiles can remove not only most kinds of skin bacteria and fungi, but it is also an excellent make-up foundation, facial powder, oil controller and sun block against UV-A and UV-B, all in one piece.